Over the past few weeks, Good Food on Every Table has published a number of stories about some excellent and dedicated farmers, food artisans, marketers, restaurateurs, chefs, financiers, educators, organizations, and others — all of whom are participating in FamilyFarmed‘s 11th annual Good Food Festival & Conference, which runs this Thursday through Saturday at the UIC Forum on the University of Illinois at Chicago campus. the first governor to attend the event in its 11-year history. The governor, who was elected last November and took office in January, is scheduled to speak shortly after 10 a.m. on Friday, and he will be followed by Michael O’Gorman, founder and executive director of the Farmer Veteran Coalition, which helps veterans find opportunities in farming. The event will also host Richard J. Durbin, Illinois’ senior U.S. senator, who will visit the Exhibit Hall during the Good Food Trade Show on Friday afternoon and will address a group of attendees. As I have written or edited these articles, it has struck me that each of the many individual elements packed into the Good Food Festival & Conference would make a great stand-alone event, whether we are talking about the Good Food Financing & Innovation Conference on Thursday, the multiple tracks of Trade Day on Friday, the awesome Localicious food and craft drink tasting event Friday evening, or the multi-faceted, family-friendly Good Food Festival, the big public celebration of the fast-growing Good Food movement, on Saturday. Already the oldest and biggest annual trade show focused on building markets for local and sustainably produced food, the Good Food Festival & Conference keeps getting bigger and better. So to sum it all up, here is a roundup of the highlights of the three days, followed by a list of our stories about some of these great Good Food leaders. I hope you will read some of the pieces you may have missed, and I hope to see you at the UIC Forum! Expanding markets for local and sustainably produced food is at the heart of FamilyFarmed and its Good Food Financing Festival & Conference. Learn from business leaders (including Michael Bashaw, Midwest region president for Whole Foods Market, a premier sponsor of the Good Food Festival & Conference), experts, investors, owners of successful Good Food businesses, Good Food celebrities such as Rick Bayless of the Frontera Mexican restaurant group, and leading officials from the USDA and Small Business Administration. This year’s Financing & Innovation Conference features a discussion of Family Farmed’s exciting new Good Food Business Accelerator, and there will be business pitches by Accelerator Fellows and other great entrepreneurs. The Financing Fair features 30 promising business exhibitors! Cap the day with a reception presented by Chicago’s Farmhouse Tavern. The centerpiece of the Friday’s multi-faceted Trade Day program is the nation’s oldest and biggest Trade Show that is focused on local and sustainably produced food. 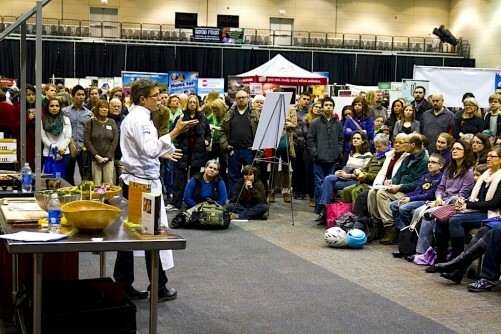 Meet and network with more than 100 food and farm exhibitors in the main hall — and attend the Opening Symposium (with its all-star lineup of experts across the Good Food spectrum). There will be stimulating panels in four individual tracks: Good Food Business Trade, School Food, Food Policy, and Producers. Celebrate Angelic Organics Learning Center’s Beginning Farmer and Mentor Farmer of the Year award winners. And end the day’s program either by attending the Meet the Buyers networking reception or a showing of the documentary film GMO OMG sponsored by Chipotle Mexican Grill, a premier sponsor of the Good Food Festival & Conference. 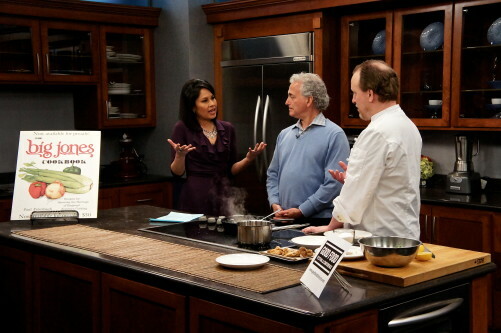 Localicious on Friday night will feature top Chicago chefs such as Paul Fehribach (right) of Big Jones restaurant, who conducted a cooking demo on ABC7 Chicago with host Stacey Baca and FamilyFarmed President Jim Slama this past Sunday. Fehribach will receive the Good Food Chef of the Year award at the Good Food Festival Saturday. Don’t miss this delicious — and affordable — tasting party, and buy your ticket now online for a $15 discount over the at-the-door price. 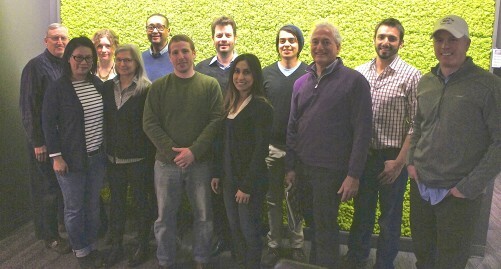 Localicious is sponsored by Local Foods, a distributor that is building an innovative Chicago retail market that will open this spring, and Onyx, a producer of sustainable foodservice products. There is something for everyone, all of Good Food interests and all ages, at the Good Food Festival — FamilyFarmed’s big public celebration of the fast growth and wide reach of the Good Food movement. • Meet the People Who Make the Food You Love to Eat: The exhibit hall will feature around 150 farm and food producers and vendors. Chat with them to learn more about their good work on Good Food. Many will have delicious products for you to buy and take home! • Learn from Top Artisans: Greg Wade, head baker for Publican Quality Bread and the restaurants of the One Off Hospitality Group, will conduct a master class on artisan bread baking. Dave and Megan Miller of Baker Miller will do a workshop on milling and cooking with heirloom grains at home. And Rob Levitt of The Butcher & Larder, the very popular Chicago butcher shop, will show you how to make your own charcuterie. • Meet Great Chefs! The “Chefs at Play” segment will feature a rare public demonstration of the Pilot Light program — which helps Chicago Public Schools integrate food education into its curriculum — conducted by top chefs Jason Hammel (Lula Café and Nightwood) and Matthias Merges (A10, Yusho, Billy Sunday). Paul Fehribach of Chicago’s excellent, Southern-themed Big Jones restaurant will receive FamilyFarmed’s Good Food Chef of the Year award. And Nicole Pederson of Evanston’s highly regarded Found Kitchen and Social House will conduct a cooking demo! 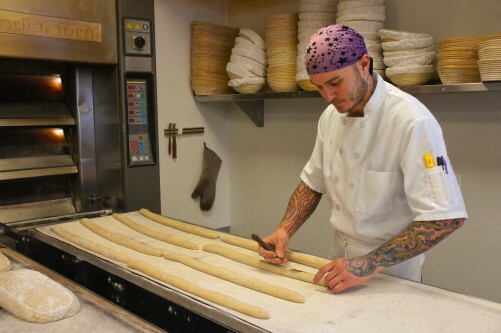 Jason Hammel, chef-owner of Lula Cafe and Nightwood Chicago, will demonstrate the Pilot Light childhood food education program at the Good Festival. 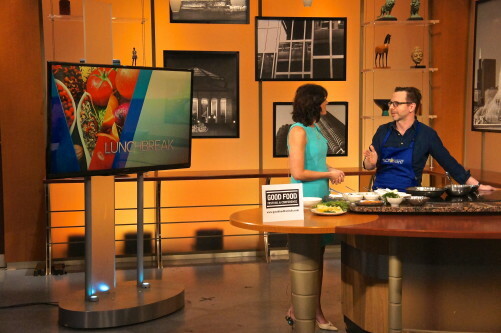 Here he chats with WGN-TV’s Dina Bair about the Festival and Pilot Light during a noon news cooking segment Monday. • FamilyFarmed is Family-Friendly: Bring your children! Along with the Pilot Light program demo and the Good Food Commons, there will be an entertaining and informative Kids’ Corner sponsored by the nonprofit group Purple Asparagus. • More Great Panels: Hear a discussion on The Future of Food, moderated by WBEZ’s Monica Eng and including panelists from Crain’s Chicago Business (also a premier sponsor of the Good Food Festival & Conference), Grow Greater Englewood, Pilot Light, and the Sugar Beet Co-op. This is followed by a powerful panel on Grass-Roots Food Activism moderated by Alex Poltorak of Urban Canopy and featuring Mark Kastel of Cornucopia Institute, Dave Murphy of Food Democracy Now, Kerri McClimen with Pew Charitable Trusts, and Wes King of the Illinois Stewardship Alliance. Celebrity chef Rick Bayless, a longtime supporter of local and sustainable sourcing, will sign various titles from his collection of authentic Mexican cookbooks derived from his Frontera restaurant group in Chicago on Thursday, scheduled for 2:45 p.m.
Frederick Kirschenmann — president of the Stone Barns Center for Food & Agriculture in New York, a professor at the Leopold Center at Iowa State University, and an intellectual force in the Good Food movement — will sign his book Cultivating an Ecological Conscience on Friday, scheduled for noon. Veronica Bosgraaf, author of the vegetarian cookbook Pure Food, will be on hand to sign on Friday and Saturday, scheduled for 1 p.m.
LaManda Joy, whose Peterson Garden Project in Chicago has made her a leader in the community garden movement, will sign her book Start a Community Food Garden: The Essential Handbook on Saturday, scheduled for 2:30 p.m.
• And what would a Good Food Festival be without great things to eat and drink? 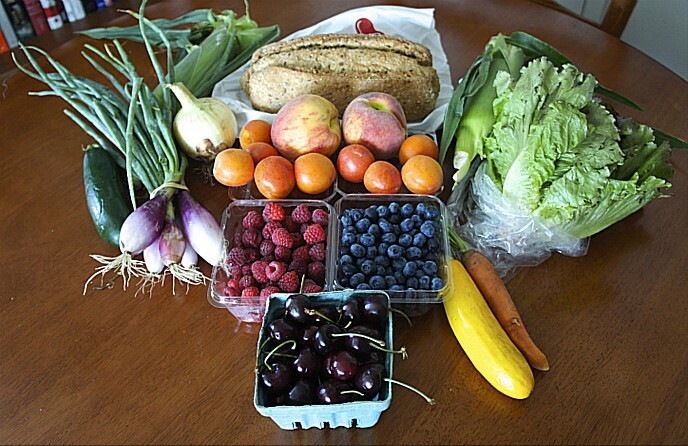 Visit the Good Food Court to purchase some of the area’s best local and sustainably produced food. And in a first for the Good Food Festival, there will be a Craft Drink Corner, presented by Farmhouse Tavern, where craft beer and cider will be available for purchase. • The Good Food Festival also plays host to the Illinois Farmers Market Conference conducted by the Illinois Farmers Market Association, and is the staging point for the Urban Farm Bus Tour, which will visit four of Chicago’s leading urban agriculture installations. Top 10 Reasons to Attend the Good Food Festival! This entry was posted in Food Artisans, Food Entrepreneurs, Good Food Business Accelerator, Good Food business development, Good Food Festivals, Good Food Financing Fair, Good Food movement, Good Food tasting events, Local Food, Regional food systems, Sustainable food business investment, Sustainable food systems and tagged Chipotle Mexican Grill, Crain's Chicago Business, FamilyFarmed, Frontera, Good Food Festival, Good Food Festival & Conference, Good Food Financing &Innovation Conference, Illinois Farmers Market Assocation, local foods, Localicious, Rick Bayless, Whole Foods Market. Bookmark the permalink.